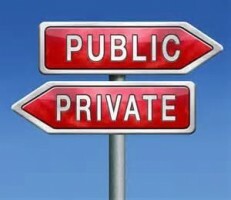 Privatization: Is It Truly In The Public Interest? In September 1987, President Ronald Reagan issued Executive Order 12607 and established the Commission on Privatization (Commission). The purpose of the Commission was “to review the appropriate division of responsibilities between the federal government and the private sector and to identify those government programs that are not properly the responsibility of the federal government or can be performed more efficiently by the private sector.” In March 1988, the Commission issued its report, Privatization Toward More Effective Government, and concluded that a number of government activities could be transferred to the private sector. Some of these programs included low-income housing, federal loan programs, educational choice, prisons and federal asset sales such as Amtrak and the Naval Petroleum Reserves. Since the 1980s, various levels of governments have been sending public services to the private sector in an effort to find effective ways to make do with less. The justification for privatization is that private companies do better, cheaper and more efficiently than the government. In theory, the idea of privatizing public goods and services to reduce costs makes sense. For example, privatizing interstate highways, trains or postal service will mean that large expenses will be eliminated from the government’s budget, thus reducing deficits. There is a deeply ingrained belief that privatization leads to a smaller government that will reduce costs to the taxpayers. In addition, outsourcing public goods and services encourages competition, which drives prices down. But do private companies really do a better job than the public sector? Does privatization really save the government money? Over the last decades, there have been numerous examples that prove privatization has resulted in higher costs and consequences when the government turns over public services to a for-profit company. It is important to note that a private company’s motivation is not the common good; it’s profit. The profit motive can reduce service quality or even endanger public safety. For instance, many cities have privatized the installation of speed and traffic cameras. While public law enforcement uses good judgment, fairness and justice, private companies do not consider these because they are only interested in profit. According to a report issued by United States Public Interest Research Group (PIRG), “Caution: Red Light Cameras Ahead: The Risks of Privatizing Traffic Law Enforcement and How to Protect the Public,” contracts between private camera vendors and cities can include payment incentives that put profit above traffic safety. The report found that profit incentives threaten public safety especially when yellow light duration is shortened. Some cities in California allow private companies to impose penalties on the cities if yellow light durations are extended, which would reduce the number of tickets the systems can issue. In other words, the more tickets a camera system issues, the more profit the private company collects. When the government decides to outsource a function or a service, it is not without risk. More times than not, the risk of corruption or fraud exist. According to In the Public Interest, a nonprofit organization that tracks privatization and contracting, companies that receive lucrative contracts may not be the best company for the job, but instead may have the most insider connections. For example, two Pennsylvania judges received $2.6 million over seven years from Pennsylvania Child Care LLC, a private company that operated a juvenile contract with the county and aggressively sentenced children for minor infractions to ensure that the detention center remained at capacity. In early 2009, the two judges were charged with racketeering, extortion, bribery, money laundering and fraud, among other crimes. In another troubling example based on an article from the Federal Times, the U.S. Department of Homeland Security was scrutinized by Congress for recently awarding a $190 million contract to a private company accused of defrauding the government. USIS, a private company that conducts background checks for the federal government, got a new contract despite ongoing litigation with the U.S. Department of Justice. The Justice Department filed a lawsuit against USIS accusing the company of delivering 665,000 background investigations from March 2008 through September 2012 that failed to undergo contractually required initial quality reviews. In addition to corruption and fraud risks, privatization and outsourcing involve giving up the government’s control while putting reliance on to private companies. This could potentially result in wasting large amounts of money, instead of cost savings. Privatization requires substantial administrative resources to monitor and oversee the contracts. If governments don’t have adequate monitoring or oversight, they run the risk of poor contractor performance and costly disasters. Some government agencies may not even have the metrics in place to prove that outsourcing a service will actually save money. Before governments decide to privatize or outsource, the first step is to perform a thorough cost-benefit analysis to see if a third party can effectively deliver services better or cheaper. Sometimes, the lowest bid is not always the best option. In a bidding war, competition drives prices down and the lowest price often wins. However, the problem arises when cost savings are unrealistic and don’t materialize, coupled with cost overruns, underperformance and inadequate monitoring and oversight. If that’s the case, privatization is more expensive than in-house services for governments. Despite the challenges, there were privatization efforts that have been successful. However, one of the most overlooked effects of a successful privatization is whether the net cost savings are realized. For example, if one government agency saves some money by outsourcing a service at the expense of laying-off public employees, then another part of the government might spend more on poverty, food stamps or health programs for those who lost their jobs. So, does privatization really cut costs, or does it just shift them? Proponents of privatization have claimed that the private sector can provides cost savings, increases efficiency and offers better service quality. On the other hand, opponents of privatization have expressed their concerns about profit motive, increased costs, loss of transparency and accountability, inadequate monitoring and oversight, corruption and fraud risks, among others. The ongoing public policy debate about public versus private is here to stay. There is a major conflict of interest between these two because public good and profit motive don’t go well together. When services are privatized, the public interest is diminished in favor of profit. Although privatization efforts have been tried on all levels of governments, there are varying degrees of successes and failures. This is a good time for many governments to evaluate the results of privatization efforts over the years and ask whether it has worked or not. Perhaps the biggest question to ask is whether privatization is truly in the public interest.